VATICAN CITY – After a three-day trip to Austria in early September, Pope Benedict XVI is putting away his traveling shoes and settling in for a long fall and winter at the Vatican. The next foreign trip fixed firmly on the pope’s calendar is mid-July of 2008, when he plans to fly to Australia for World Youth Day celebrations. Vatican officials say the pope also expects to visit the United Nations and New York in 2008, and April now looks like a likely time frame. He could easily add one or two other eastern U.S. cities, such as Philadelphia or Boston, to that itinerary. Other foreign travels in the first half of 2008 look less probable. There was talk about a possible papal trip to Quebec for the International Eucharistic Congress in mid-June, but Vatican sources said no concrete plans were being made for such a visit. A papal visit to the Marian sanctuary at Lourdes, France, may occur, but probably later in 2008. The Council of Europe in Strasbourg, France, also has invited the pope, but there’s been no answer yet. If the pope does go next year, church sources think it would be in the fall, perhaps in connection with the Lourdes visit. Despite a recently renewed Israeli invitation for a papal visit, Vatican sources said there was no rush to make that happen in 2008. When Pope Benedict was elected, he said he’d be more of a stay-at-home pope than his globe-trotting predecessor, Pope John Paul II. But four months after his election, Pope Benedict was presiding over World Youth Day in Germany, and in 2006 he seemed almost restless, making four trips outside Italy. To date, he’s made seven foreign trips – more than most people expected. Unlike Pope John Paul’s barnstorming tours, however, Pope Benedict’s foreign journeys have been brief and generally close to home. In Pope John Paul’s first seven trips, he visited five continents, from Japan to Mexico, and logged more than 60,000 miles. Pope Benedict has strayed outside Europe only twice – to Turkey and to Brazil. The pace of the visits has also changed. Pope John Paul spent 53 days on the road during his first two and a half years, giving 313 speeches in foreign countries. 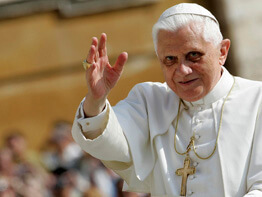 Pope Benedict has spent 25 days traveling, delivering 74 speeches on the road. Health does not appear to be an issue for Pope Benedict, who scoots up stairs and strides onto podiums with an energy and ease that often surprise people. There are other reasons the pope is staying close to home in the coming months, however. For one thing, he has a backlog of “ad limina” meetings to get through, with bishops from Asia, Africa and Europe coming through his door for their periodic consultations. The pope is also said to be dedicating much of his time to two special projects. The first is completion of his second volume on the life of Jesus, expected to cover Christ’s passion, death and resurrection. The first volume, “Jesus of Nazareth,” was published last spring. The other project, more nebulous, is the pope’s second encyclical. The pope tantalized reporters during his summer vacation in northern Italy by telling them he was working on a new encyclical, and a Vatican spokesman later said it would be related to Catholic social teaching. Probably the biggest public event on the pope’s fall calendar is the anticipated naming of new cardinals and a consistory at the Vatican. Most expect the pope to announce the cardinals’ names in late October and preside over the consistory liturgies Nov. 24-25. At that time, the pope would have at least 17 vacancies to fill among the cardinals who are under age 80 and can vote in a conclave. The limit of voting-age cardinals is 120, although Pope John Paul sometimes went over that number. Among those expected to get a red hat this time around are U.S. Archbishop John P. Foley, who was recently named pro-grand master of the Knights of the Holy Sepulcher of Jerusalem. Other U.S. possibilities include the archbishops of Washington and Baltimore. But Vatican sources noted that retired cardinals from both those archdioceses are still among the 11 U.S. cardinal electors, making new cardinals less likely this time around. The pope’s list of cardinals is expected to include four or five Roman Curia officials and the new head of the Italian bishops’ conference, Archbishop Angelo Bagnasco of Genoa. Other European candidates include the archbishops of Paris; Dublin, Ireland; and Warsaw, Poland. In Africa, potential cardinals are found among the archbishops of Kampala, Uganda; Nairobi, Kenya; and Abuja, Nigeria. In Asia, a potential cardinal comes from Mumbai, India; and in South America, potential cardinals are found in Sao Paolo and other Brazilian archdioceses.